Near the last days of fall color in Michigan’s northwest corner, where I live, squirrels were especially active. They darted across the two-lane roads in front of my bicycle. 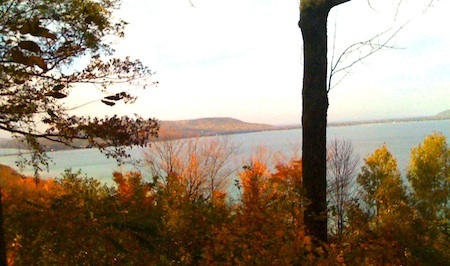 On one ride to Glen Arbor (that’s Glen Lake in pix above) you could hear their quickening steps on the forest’s dry leaves, like the brushed strokes on a tight snare drum. Foraging and darting, they prepared for a cold winter. We are told that people are the smartest living organisms on the planet. We are capable of assessing conditions, reasoning, anticipation, and action. We use tools and show emotion. But watching our region’s squirrels make preparation for a season of cold prompted pause about our capabilities. Here in the U.S. we face a lengthening season of distress, maybe a decade or more of perilous transition as markets change and climate change bears down on our stability. But we are making scant effort at preparation. In fact, with more diligence than ever before, we are doing the very things that are certain to make the crisis worse. We are digging for coal and drilling for oil with prodigious resolve. We are opposing wind and solar and efficiency gains that would rebuild and rejuvenate the economy. And we are content with the politics of austerity and disinvestment that assures we delay indefinitely the principle of shared responsibility that would help us invent a new national mission. Squirrels, meanwhile, prepare for the new season of cold and dark. Hear them scurry on dry leaves. They are getting ready for what’s next.